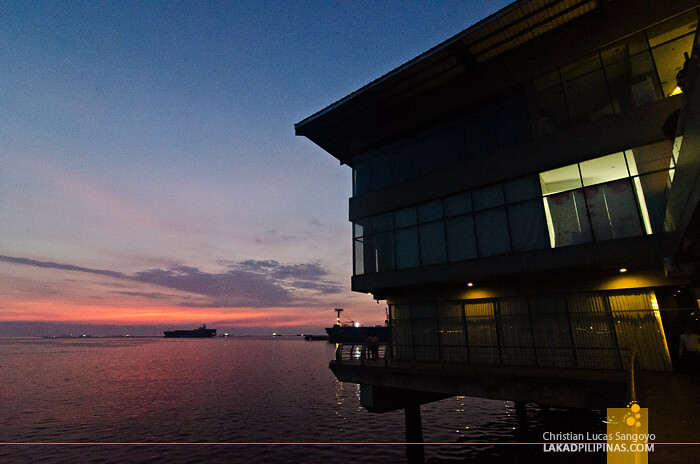 Manila Bay has always been famous for its sunset. During weekends, people flock over to the baywalk fronting its waters just to sit still and watch the fiery sun descend over the horizon. This time though, we were watching it not from the prominent boulevard but from the comforts of our own room at Hotel H2O. And what a grand view it was. It was indeed a weekend, and weekends at the Manila Ocean Park was probably the worst time to visit the place since it transforms to a mad bedlam of park-goers and students on their field trip to the only oceanarium park in the Philippines. But, we were willing to brave the crowd. 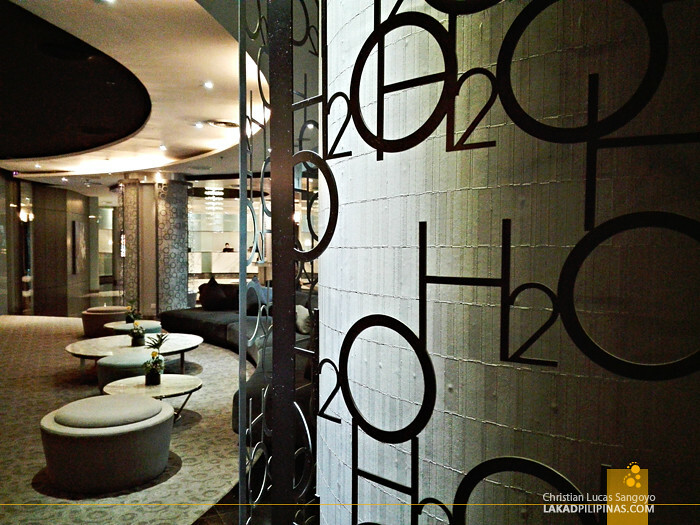 Along with the usual gang, we’ve always wanted to spend an evening at Hotel H2O which is located right inside Manila Ocean Park’s complex. 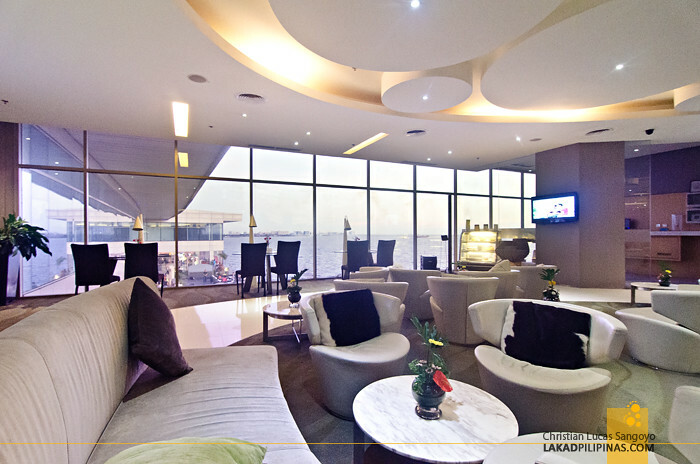 With Manila’s horrendous traffic and the crowd of people outside the park, we breathed a sigh of relief as we finally entered the hotel and sat ourselves down its chic comfy couches. 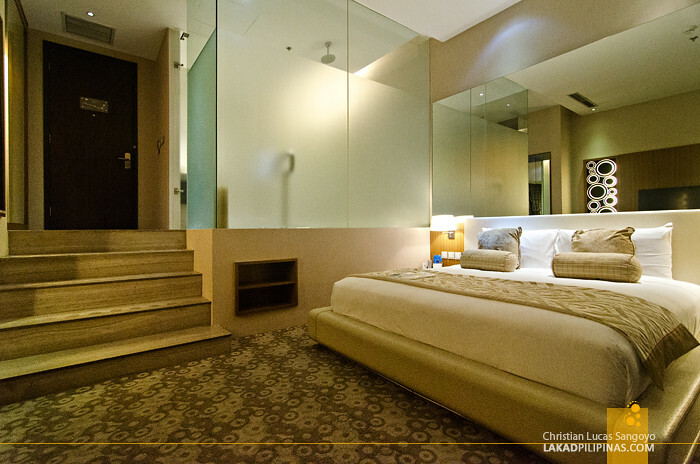 The hotel opened its doors a year after Manila Ocean Park soft-opened to the public in 2008. It houses 128 rooms and 19 suites on two floors with eleven room types ranging from lodgings facing the park, to ones with a grand view of the bay, to the famous jelly fish and aquarium rooms. Our group was lucky enough to be billeted on different rooms so we were able to see most of their popular ones. The Aqua Room [CHECK RATES], one of Hotel H2O’s most coveted rooms was quickly taken by my friends. Contrary to what we were all imagining it to be, its walls do not open up to the oceanarium. Rather, it features a half-wall of continuous aquarium. Still, it is a gorgeous room to spend the night in. Personally, I dig their Club Jellies Room more. 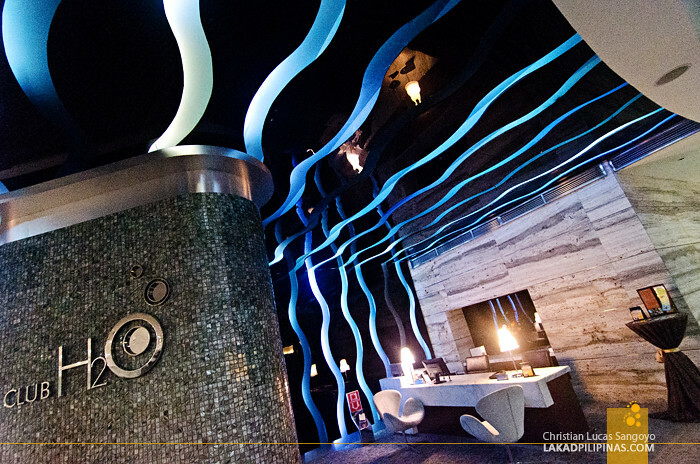 Rather than saltwater fishes, its aquarium walls are instead filled with jellyfishes. The aquarium changes lights at regular interval making the creatures we all abhor when swimming on beaches, rather mysteriously beautiful. Watching these jellyfishes swirl about can be very hypnotic. CLUB BAY ROOM, WHAT A VIEW! The room I was assigned to was Hotel H2O’s Club Bay Room. 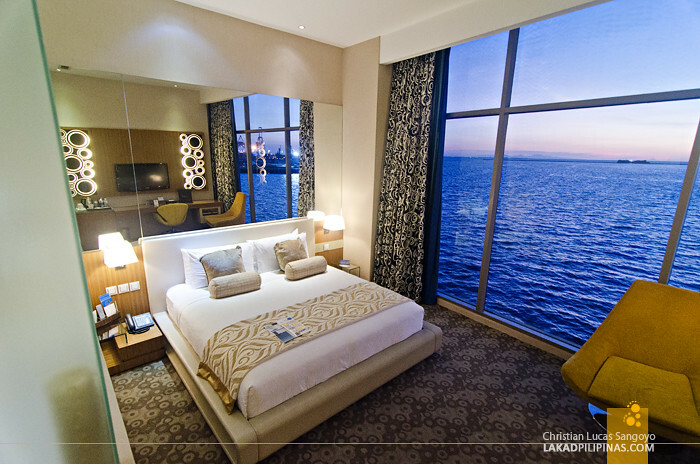 It has no fishes, it has no jellies, but what it has is a panoramic view of Manila Bay through its huge floor to ceiling wall. The main chamber drops five steps down from its vestibule where the closet and the entrance to the glass-enclosed toilet and bath is located. 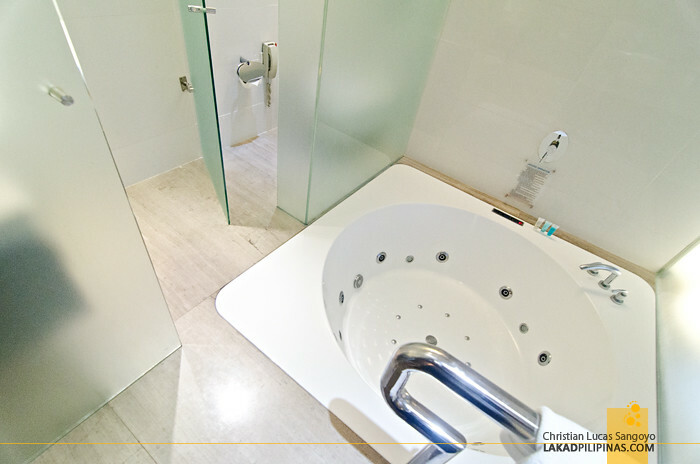 YES, WE HAVE A PERSONAL JACUZZI! 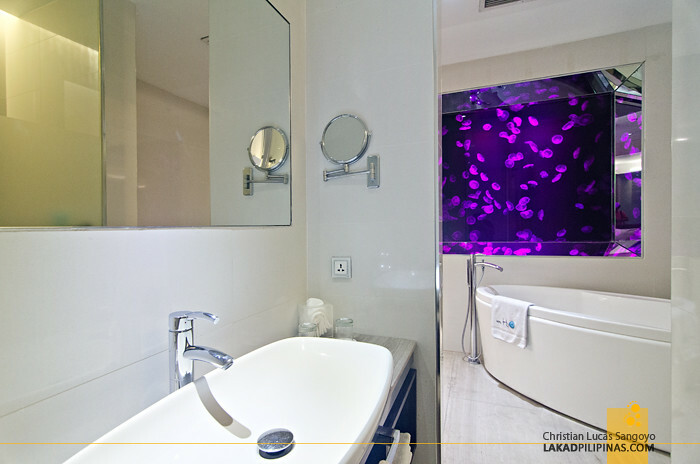 It has all the amenities we expected from Hotel H2O; flatscreen cable television, tea and coffee making facilities, electronic safe, a mini bar, free Wi-Fi plus more; it has a Jacuzzi inside its spacious bathroom, my friend. The only thing missing, really, was a balcony that extends towards the bay and it would’ve been utterly perfect. 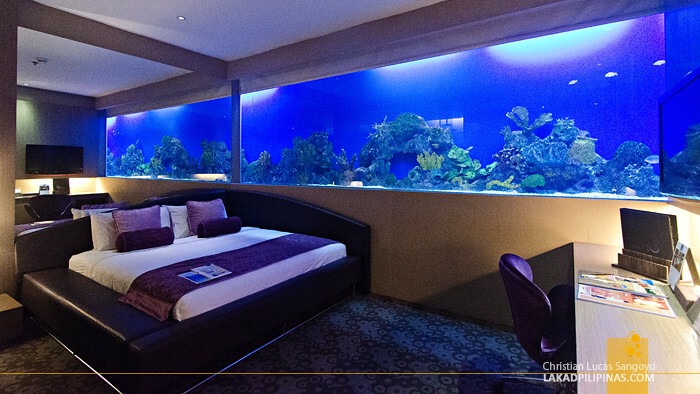 We definitely wouldn’t exchange this for any of the aquarium rooms. 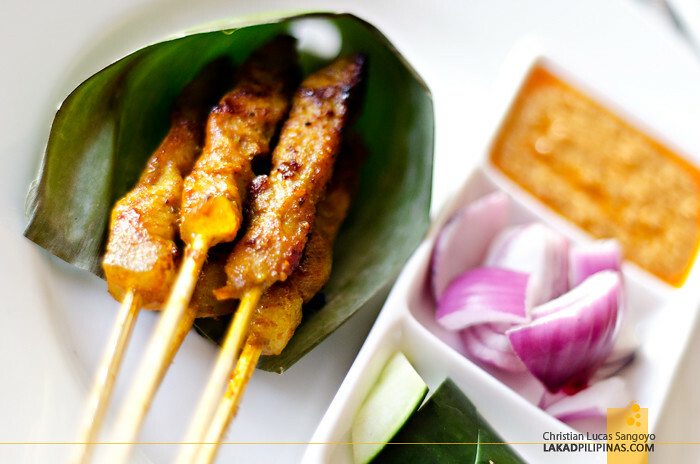 A stay at Hotel H2O includes a complimentary buffet breakfast at their in-house restaurant, Makan Makan. 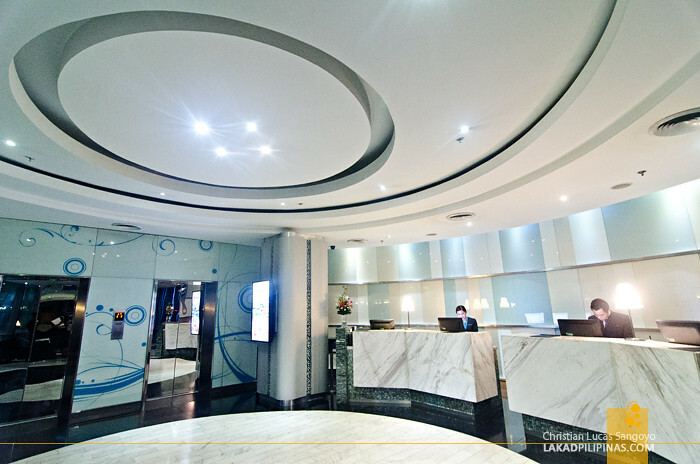 Located on the second floor of the Manila Ocean Park, it can be directly accessed from the hotel even if the place is also open to the public. 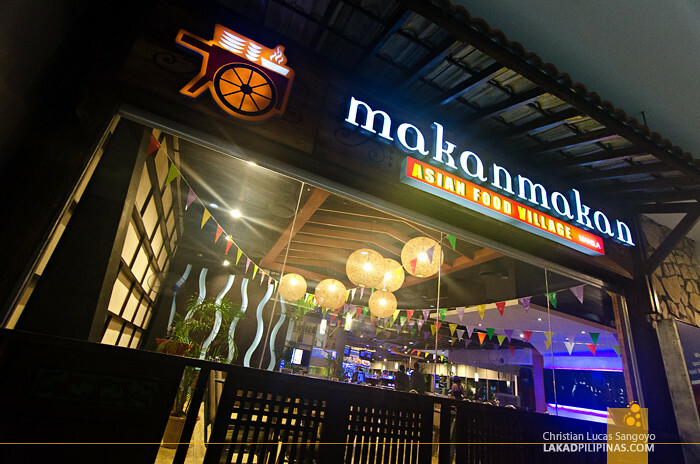 Makan Makan, which is Malay for eat eat, offers a wide selection of Asian dishes. 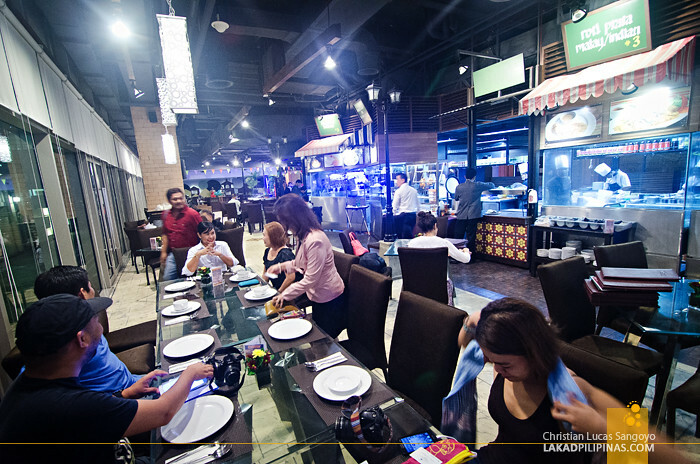 The restaurant is aptly laid out like stylish Singaporean hawker stalls complete with streetlamps. 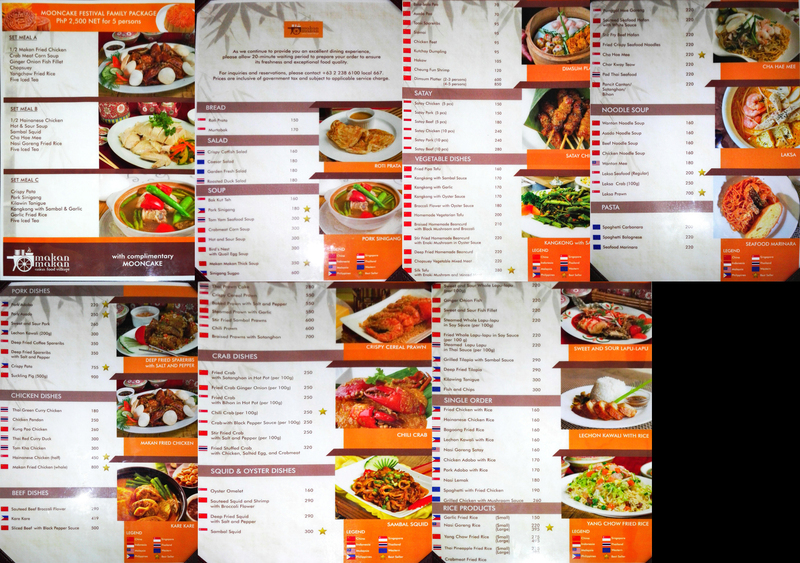 We went here for a late lunch and dinner and were able to sample a few of their offerings [CHECK MAKAN MAKAN FULL MENU]. 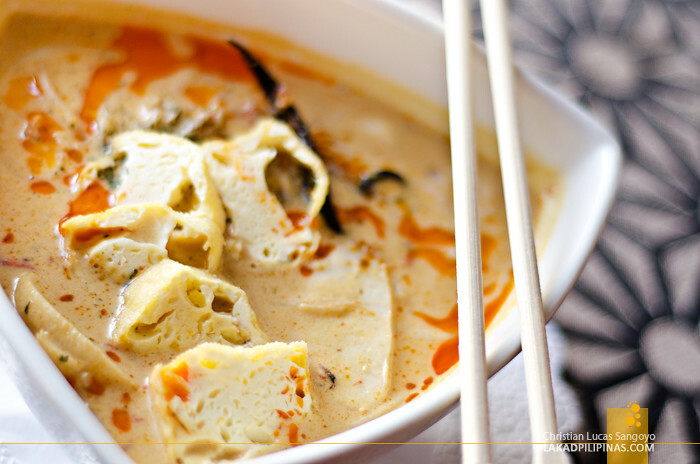 After spending two months across South East Asia last summer, we were quite excited after finding out the restaurant’s specialty as we really miss the food we had during that trip. 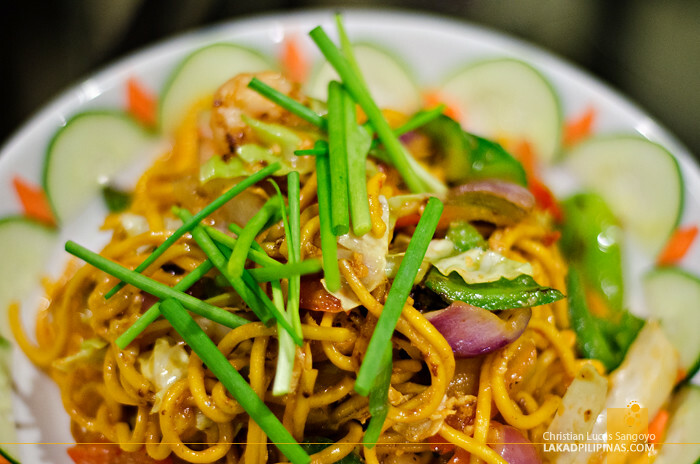 We went for their roti prata, tom yum soup, satay, laksa, sambal squid, prawns, hainanese chicken and of course, mee goreng. Price is very reasonable as most of the dishes laid on our table were good enough for sharing. It was a feast, if ever there was one, with their laksa and mee goreng topping the list for me. For our pampering needs, Hotel H2O also offers spa services via Zenyu Eco Spa. Zenyu, which means complete healing in Japanese, offers negative ion treatments including hot bed services where guests are laid down on a sauna-like room to sweat out toxins for an hour. We’d heard excellent testimonials for this treatment, especially from cancer patients, so we also tried it out before availing of their superb Swedish massage. We, of course, went around Manila Ocean Park, all of us being first time visitors, and right after, headed to the hotel’s swimming pool which is located on the ground floor of the complex. Their pool is like a huge Jacuzzi with roiling water and bubble jets. It was quite nice to relax in except for the loud music on the other side where the park’s sea show is location and the buffet restaurant right across it. If privacy is your thing, I suggest you skip this. It was almost sundown when we regretfully checked out of our rooms. 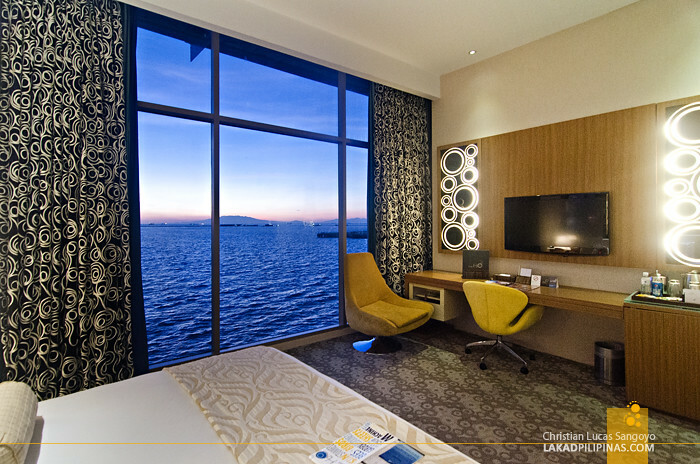 We still can’t get over our stay that we lingered at a restaurant at the ground floor of the oceanarium to have an early dinner and witness another fiery day’s end light the waters of the Manila Bay. It was the most fitting way to end our weekend staycation at Hotel H2O. How was your stay? 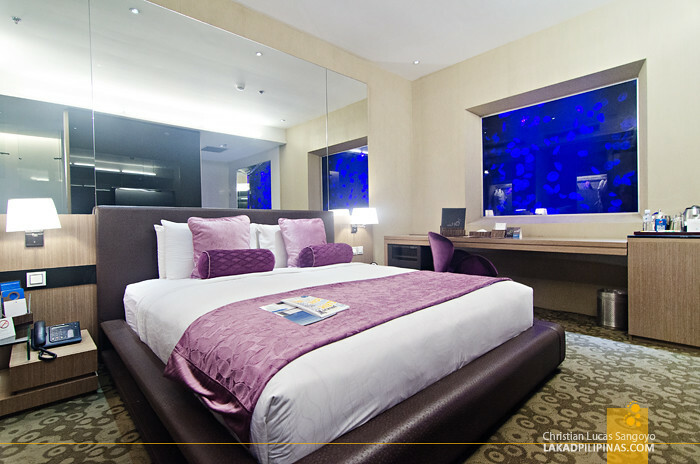 Does the room look exactly the same as the hotel photos? Planning to stay soon! Rooms looks amazing!! Sorry for the question.. my kids wanted to have an overnight stay just to experience it as they also wish to have a tour of the Manila Ocean Park.. My 2 teens (13 and 14) isn't ready yet taking a separate room. Are there arrangements with H2O on this kind of setup. Or can we just pull them over as our own visitors just like in other hotels that are lenient to visitors?